Ovtcharov vs Samsonov: friends turn rivals for Rio 2016 quarter-finals. 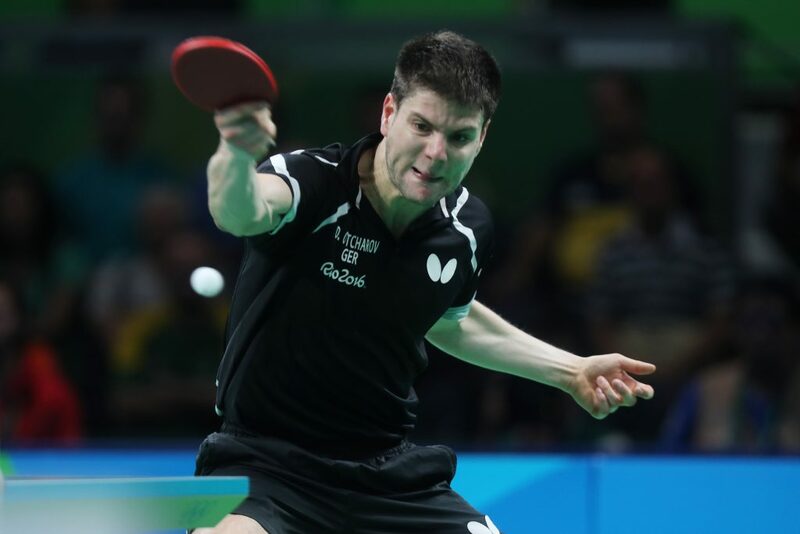 Two Table Tennis giants will fight it out for a place in Thursday's Men's Singles semi-finals, as Germany's Dimitrij Ovtcharov takes on Vladimir Samsonov of Belarus. Both players know each other well, and always produce spectacular matches when they go head-to-head on the table. But there can only be one winner, and each goes into the tie aiming to eliminate the other. Dimitrij Ovtcharov and Vladimir Samsonov entered Rio 2016 at round three, seeded 3rd and 7th respectively in the Men’s Singles draw. First up for Ovtcharov was a tough encounter with Li Ping (Qatar) where the German player required the full seven game distance to progress through to the next round. His second tie was against Slovenia’s Bojan Tokic which was won 4-1 by Ovtcharov, and featured an Olympic record number of points scored in a single game (64). Samsonov’s Rio 2016 campaign so far has seen the 40-year-old fend off challengers Kristian Karlsson (Sweden) and Paul Drinkhall (Great Britain) both by 4-2 scorelines. Both Ovtcharov and Samsonov play their club Table Tennis with Russian side Orenburg, and after their victories in the last 16 in Rio, the two players spoke about their upcoming meeting in the quarter-finals. “He’s a top ten player; we have been playing together in a team for many years. He’s a good friend. But tomorrow is one of the most important games of our lives and each of us will try to win.” – Dimitrij Ovtcharov. Dimitrij Ovtcharov and Vladimir Samsonov have met on a couple of occasions over the past year, with the German player edging the finals of the 2015 European Games and the 2016 DHS Swiss Open against Samsonov in seven ends. They both also competed at the 2015 Qatar Open, with Ovtcharov claiming a 4-1 win over Samsonov. The Belarusian did manage a straight games victory against Ovtcharov at the 2013 European Championships, however, he hasn’t beaten the German competitor since. Samsonov’s Olympic debut came back in 1994 (Barcelona) and, rather surprisingly, has never advanced beyond the quarter-finals of the Men’s Singles category. Ovtcharov, on the other hand, arrived on the Olympic stage at the Beijing 2008 Games, and four years later in London he went on to win the bronze medal match against Chuang Chih-Yuan (Chinese Taipei). You can watch Dimitrij Ovtcharov and Vladimir Samsonov’s match live at 16:00 (GMT-3) HERE.